Panjab University syndicate today referred back to the committee which had sought representation to students in the university senate, the premier decision making body on academic and administrative affairs. A national policy on police training is on the cards. With the new challenges posed by the high-tech crimes and terrorism, the national policy being drafted by the Bureau of Police Research and Development (BPR and D), a central research organisation on policing, will address the need for enhanced investigating skills by imparting quality training. 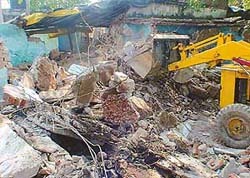 Construction of the Rs 22.37-crore advanced trauma centre at the PGI will begin soon as the Central Public Works Department (CPWD) today returned Rs 5.15 crore given to it for the task almost two years back. On May 13 three persons were crushed to death by a train on the Zirakpur-Lalru section of the Kalka-Ambala line. Sujit Kumar and Manoj Yadav were mowed down by a train heading towards Ambala while Raj Kumar was crushed to death on the railway track near Dera Bassi. Even as the meeting of the Finance and Contract Committee (F&CC) of the Chandigarh Municipal Corporation was adjourned yesterday, a serious view was taken of the irregularities that attracted audit objections. A CPWD employee, Bant Singh, was killed when his scooter collided head on with a truck at the Sector 45-46 traffic light point today. The People for Animals (PFA), a non-government organisation working for animal welfare and environment awareness has offered following animals for adoption free of cost. The Crime Branch of the Chandigarh Police today seized seven computers and documents of the SAS Nagar-based office of Online JobWork.com (P) Ltd. in a raid. The Pinjore police tonight registered a case of attempt of robbery against unknown persons in connection with the highway robbery case on the Pinjore-Nalagarh road. Ranbaxy Laboratories Ltd has been awarded the National Safety Awards for the year 2001 and 2002. The company’s active pharmaceutical ingredients facilities at Mohali and Toansa ( Punjab) were honoured with awards at a function held in New Delhi recently. The newly elected representatives of the Panjab University Campus Students Council were administered oath of office at a ceremony held at the English auditorium on the campus here today. Thumping beats of reverberating music echoed against the decked up walls of Panjab University’s evening auditorium as members of the French Literary Society celebrated the arrival of the new batch during freshers’ party “La Joie”. The Guru Gobind Singh College for Women, Sector 26, has become the first degree college of the city to get accredited to the National Assessment and Accreditation Council (NAAC) of the University Grants Commission (UGC). Two students of class VIII Sukhmantar Singh (13) and Hartejbir Singh (14), Government High School, Desu Majra, were allegedly beaten up by the Principal of the school today. They were taken to the Civil Hospital, Kharar, by their parents. Hearing in the corruption case filed against Punjab Agriculture Minister Rajinder Kaur Bhattal was adjourned today till further orders following summoning of case records by the Supreme Court. The court had summoned the records in the case. Taking up a contempt of court case against The Tribune, Mr Justice G.S. 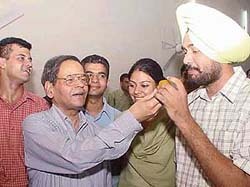 Singhvi and Mr Justice Swatanter Kumar of the Punjab and Haryana High Court today held the newspaper’s Associate Editor A.J. Philip and Staff Correspondent Rajmeet Singh guilty of contempt. The details of the order were not yet available. Lashing out at the political system wrought with maladies, Kewal Dhaliwal’s Hindi play, “Saiyan Bhaye Kotwal” was performed to an encouraging response at Tagore Theatre this evening. The Hindi adaptation of Vasant Sabnis’s Marathi play, bared the existing rot, which spans all aspects of the social milieu. Presented in the original style — Tamasha of Maharashtra — the play brought home sensitive themes with ease and elan. Picking up old melodies and presenting them in a contemporary style is his passion, an outlet for his creativity. And though singers of the old genre might frown upon this trend of remix songs, Harry Anand, who is topping the charts for producing hit remixes like “Kaanta Laga” and “Koi Sehri Babu”, has no qualms about giving music of this kind or singing songs which please the young generation. Varinder Vizz, the latest entry in to the world of Punjabi pop, is all set to charm music lovers here. With his debut album “Desi No. 1” launched at the Chandigarh Press Club today, which was followed by a scintillating performance at a music store in Sector 17, Varinder could not have had a better opening with a supportive music director, Harry Anand, to lend him support not just when it came to facing the Press but also when he faced the audience. Punjabi poets and scholars discussed today Harmeet Vidiarthy’s anthology “Samundar Buland Hai” in an interactive session organised at Sri Guru Gobind Singh College in Sector 26 here today. VRV Singh of Chandigarh emerged as the fastest bowler when he bowled at 133 kmph on the second day of the ongoing Scorpio Speedster carnival which attracted about 1000 youngsters from different parts of the region. 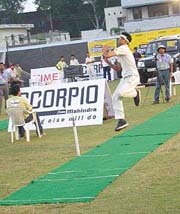 The contest, sponsored mainly by Mahindra and Mahindra, is being held in 10 cities in the country, with Chandigarh being the second centre after the first leg held in Delhi. Last evening, Jagdish had thrown at 124 kmph to emerge as the fastest. Harkiran Singh “Nippy” of St. Stephen’s Skating Club has done the city proud by getting selected in the Indian speed skating team for the World Speed Roller Skating Championship, to be held at Barquisimeo, Venezuela, from November 1 to 9. The Chandigarh Administration has cleared the name of Inspector P.K. Dhawan for promotion as DSP. His name has been placed on the ‘G’ list for promotion, along with two other inspectors, Mr Arjun Singh Jaggi and Mr Inderjit Singh. The other two were cleared for promotion on May 19. The allotment of tender for sanitation works in Panchkula has been deferred by a fortnight today. The decision was reportedly taken after a number of applicants complained that they were unable to fulfil the terms and conditions , as specified in the tender notice. The office of the Registering and Licencing Authority (RLA) in Sector 17 here has added a few facilities, including separate counters for senior citizens, disabled and defence personnel. The counters will run on all five days of the week. The Traffic Police and the Indian Oil Corporation (IOC) will launch a week-long campaign to promote the use of helmets.